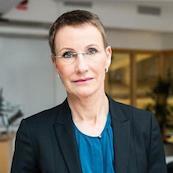 Ms. Pia Sandvik serves as President and Chief Executive Officer of Länsförsäkringar Jämtland. Ms. Sandvik is a Vice-Chancellor of Luleå University of Technology, County Director at Jämtland County Administrative Board, Pro-Vice-Chancellor and Head of Administration at Mid Sweden University and Head of Quality at Ericsson UAB. She serves as Chairman of Research Institutes of Sweden AB. She is a Board member of Akademiska hus AB, Swedish Foundation for Strategic Research and the Business Executives Council of the Royal Swedish Academy of Engineering Sciences. She has been a Director at Prevas AB since 2018. She served as a Director of Länsförsäkringar AB (publ) since 2013. She is associate professor. She has other assignments: Vice chairman in the board of The Swedish Royal Academy of Engineering Sciences (IVA), Member of the board of KTH, Member of the board of ALMI Företagspartner AB, Member of the board of Swedish Entrepreneurship Forum. She holds Master of Science in Engineering, Doctor of Philosophy in Science.